Note :- Please write your comments in the comment section of the embedded youtube video, so that all comments will be at one place. Today is the 10th day of ‘Let’s Discuss’ program. This program is like a virtual group discussion. we’ll give you a GD topic on every Tuesday. Go to the embedded youtube video and express your thoughts on the topic by tomorrow morning 10 o’ clock. We’ll read each and every comment and we’ll pin the best comment. The aim of this program is to create a platform for students to express their views, to learn from the opinions of others and to finesse their articulation skills. 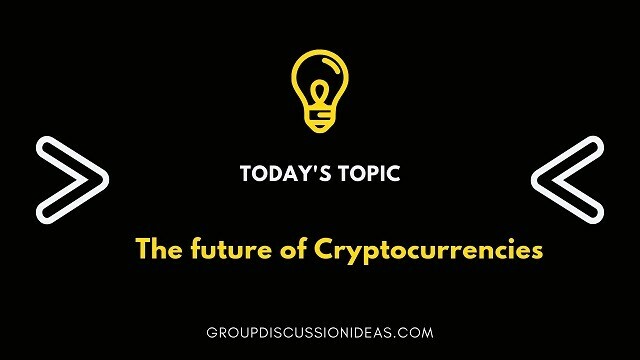 Topic is mentioned in the video (Today’s topic is – The future of cryptocurrencies). For example you want send transfer the fund to your relative who lives on the other side of the world no problem within very short time you can send it and costs is very less . In the future technology improve and businesses removing the middle man from various process which then reduces costs and make their services cheaper for the end user. Crypto-currency is a digital or virtual currency that is used as a medium of exchange. It is a form of money. People are using crypto-currencies for transaction purposes, buying goods and using services.The number of crypto-currencies available over the internet as of 19 August 2018 is over 1600 and growing. A new crypto-currency can be created at any time. By market capitalization, Bitcoin is currently (December 15, 2018) the largest block-chain network, followed by Ripple, Ethereum and Tether. In 2008, Satoshi Nakamoto had created a new currency called Bitcoin. A decade later, that currency grew exponentially. First breaking the $1,000 mark then continuing to the $5,000 and $10,000 mark only to finally crash at around $20,000. So why did it crash? Bitcoin did not crash because of regulations or any other reason that the media tries to sell to you. Bitcoin crashed because it was set up to crash. The Bitcoin crash was not something new, it was a simple repeat of the market. Bitcoin grows mostly by the purchase of coins by beginners and enthusiasts. We can call these people fools for now. They are the ones that had to suffer when the bubble burst while professionals left with their pockets full. Bitcoin, as any market, is ultimately controlled by those that own a majority of the value in it. The average traders and enthusiast will never be able to make a significant dent in the market, he can try and figure out where the controlling party is trying to take the market and cash out. He is playing someone else’s game, not his own. Cryptocurrency and blockchain technology are here to stay. That’s the future. Instead the concern we should have is how blockchain technology might be used maliciously in this future. Although largely described as secure and private, blockchain technology carries risks to our privacy. Blockchain, as a transparent and immutable ledger of all that has been, will be used to serve the interests of those that benefit and earn from our personal information. These can be governments, businesses or service providers. And they are likely to prefer centrally controlled rather than decentralised blockchain solutions. Governments are finally taking cryptocurrencies seriously. Regulation is necessary to curb the harmful actions of malicious actors taking advantage of the growth in cryptocurrency. For projects, cooperation with regulatory bodies means survival in the long term. While many see regulations and privacy as antithetical with mainstream adoption of cryptocurrencies, I believe that privacy-centric cryptocurrencies will serve an important role in the future alongside widely adopted mass cryptocurrencies. And this side by side existence need not be a lawful vs unlawful debate. Don’t get me wrong, the potential of blockchain is amazing to me – but it would be foolish to ignore the risks. We should talk openly about this while still supporting the development of cryptocurrencies.